See what drivers can do with FleetMobile. Hit the road with Azuga FleetMobile, the fleet tracking app that rewards drivers. Every Fleet subscription includes FleetMobile. 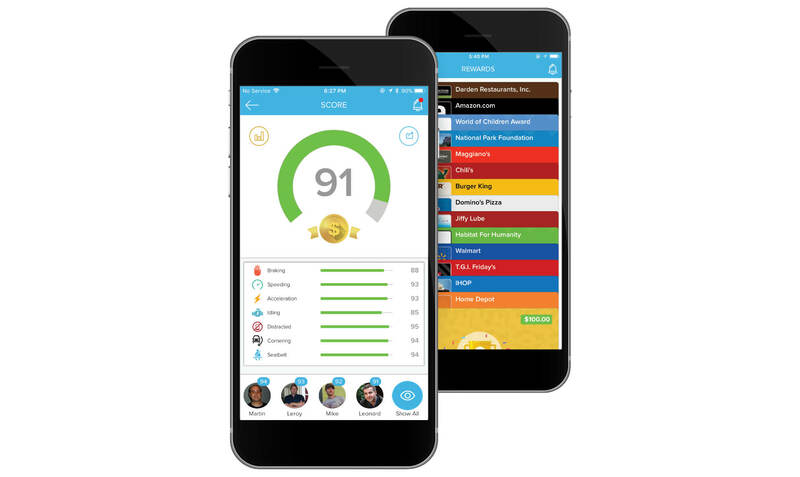 From safe-driving scores and rewards to trip logs, Azuga FleetMobile™ ensures your drivers hit the road with everything they need to get the job done. And with its admin view, FleetMobile makes it easy for supervisors to monitor and reward drivers in or out of the office. Make the job more rewarding. 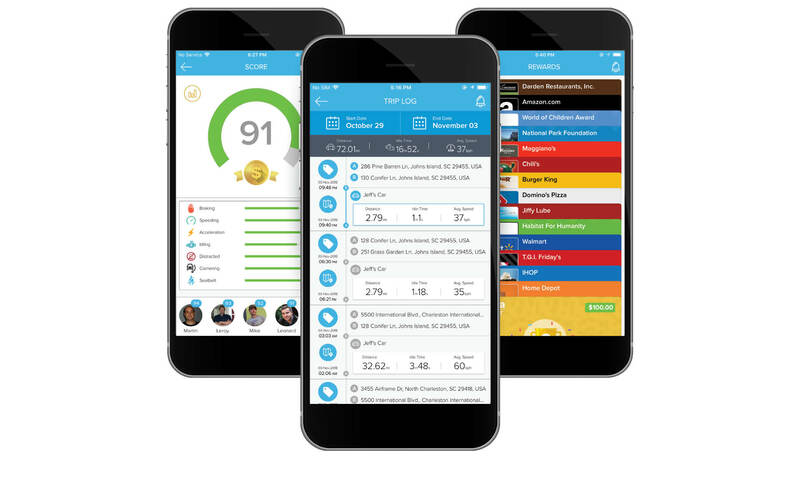 Take the perfect fleet management app on the road. With FleetMobile, each driver can keep tabs on his or her safety score. Performance is tracked in real time, making self assessment easy. Great drivers are invaluable—reward and retain them. Fleet features a rewards program that’s easy to administer, and drivers love. Add DriveSafe and block smartphone distractions—such as texting, calling, and app use—when the vehicle is in motion. Add Time Card, and FleetMobile makes it easy for drivers to track time in real time, and submit timecards right from their phones. When a driver uses FleetMobile, data is captured from every vehicle he or she drives, creating a comprehensive trip log—trips can also be tagged as business or personal. Leverage a range of built-in utilities, such as vehicle health monitoring, navigation, tracking, parked vehicle location, and third-party apps. The Azuga App for mobile phone is a great bonus so you don't have to be on your desktop to access info. One of the features about the software is the detailed data for my drivers...it helps to cross-reference their timesheet for accuracy. See all the things you can do with FleetMobile. With separate views for administrators and drivers, FleetMobile keeps your fleet rolling efficiently—from start to finish of every shift. Drivers see how well they drive, what habits need work, and how they stack up against coworkers—spurring friendly competition for rewards. Reward drivers for a job well done behind the wheel. With a tap, managers can send rewards—and drivers receive them—using FleetMobile. Quick and easy to install, Azuga Tracker OBDII installation is made even simpler with easy-to-follow instructions in hand. Tag trips as business or personal and capture details, including starting point, destination, stops, locations, distance, speed, and idle time. Alert drivers automatically when safety issues, such as speeding, are detected—and when performance badges and rewards are earned. Find places—such as gas stations, restaurants, hospitals, and ATMs—near your current location. See where your vehicle is parked, how far away you are, and follow the recommended route to get to it. View the status of a vehicle's health live, by diagnostic trouble code. View battery health trends during the past two months. Choose one or more add-ons, and do even more with our GPS mobile tracker app. Block smartphone distractions when the vehicle is in motion. In trouble? Press the Panic button to alert your manager instantly and receive the emergency assistance you need. Drivers share their location, making it easy for customers to pinpoint arrival time. Capture and playback driving events to improve driver behavior and fleet safety. Make is easy for supervisors to create and assign jobs—complete with tasks— to crew members. Make it easy for supervisors to capture details on drivers' activities in the field. Make it easy for supervisors and drivers to exchange messages, photos, videos, and locations within the Fleet system. Eliminate paper take control of tracking. With a tap, drivers can record start, stop, and break times throughout their shifts, making time tracking easy and accurate. Handy for open vehicle pools, track which driver is behind the wheel of each vehicle, and capture performance data accordingly. Have Fleet? Download FleetMobile and get rolling.